The Global Gaming Expo (G2E) Asia is the leading Asian trade event and the largest regional sourcing platform for global gaming and entertainment products. This year, G2E Asia is opening its newest show segment - Financial Technology Asia. 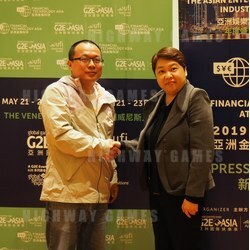 Financial Technology Asia will be jointly organised by G2E Asia and Blockchain Labs Co. Limited and will spotlight Asia-Pacific's skyrocketing FinTech industry. Financial Technology Asia will provide a specialised platform where visitors can meet and explore new partnership and business opportunities with finanical professionals. These professionals range from casino and gaming platform operators to banking and financial institutions, funding and venture capitalists and FinTech system integrators. Influential members of FinTech with an exclusively Asian perspective will flock together to share insights and knowledge. The forums themes will cover blockchain technology for gaming and lottery, together with innovations in payment and cybersecurity.